"You want to go to Athens, Charlie?" When Cliff Richard wanted to make a musical followup to The Young Ones, that film's success dictated that a number of fundamentals be retained. Several of the costars return, as does songwriting team Peter Myers and Ronald Cass, and choreographer Herbert Ross. But this time the action is much more opened up as the gang takes a double-decker bus on a holiday across Europe. Don (Richard) convinces the bus company to let him fix up a bus as a traveling hotel and take it through Europe as a dry run for a tour series. He takes with him mates Cyril (Melvyn Hayes), Steve Jones (Teddy Green) and disaster-prone Edwin (Jeremy Bulloch). As they go through the Continent, they pick up three attractive young women singers who are going to Athens for a gig as well as a fourteen-year-old boy on the run, Bobbie. However, Bobbie turns out to be Barbara Winters (Lauri Peters), an American pop star on the run, leading to romantic complications amidst plenty of song and dance. The sensitive should be warned that there are plenty of French mimes featured. The songs are a notch below those in the earlier film, although a couple hits such as Bachelor Boy did come from the score. They tend to mostly be in the movie musical mold, without much straight pop that would be better for presenting Richard's talents, and thus feels like a definite step backwards from The Young Ones. He does well enough with the material, though. The dance numbers, on the other hand, tend to be less of the big production number and more a showcase for Teddy Green's athleticism. He's quite deft and frankly more interesting to watch by himself than a dozen people moving in coordination. The backdrops of several musical numbers make good use of the locations, such as filling the whole Cinemascope screen with a spectacular shot of the Greek Acropolis while Richard sings late in the film. Richard almost fades into the background here. Part of the problem is that this time he doesn't have a strong character actor such as Robert Morley to play off of, and the result is more like a lesser Elvis vehicle. Another part is the poor choice of a romantic interest, Lauri Peters. Although she sings well enough to stand up to him, even after she's out of disguise she still looks like a fourteen-year-old boy, making the whole romance with Richard more than a little creepy. They don't have any chemistry, so the love scenes feel strictly by the numbers. 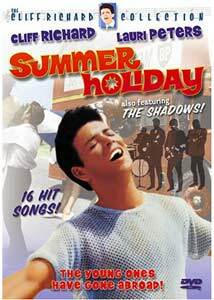 More amusing is Richard's backup band, The Shadows, as they appear throughout the film in a wide variety of cameos between Paris and Athens. Hapless Edwin is portrayed by Jeremy Bulloch, whom Star Wars fans will know as Boba Fett from The Empire Strikes Back and Return of the Jedi, though here he comes off pretty much like a clumsy Opie. Ron Moody (best known as Fagin in Oliver!) makes an appearance as The Great Orlando, head of a mime troupe also seeking a ride and trying through pantomime to persuade a French judge not to hold the lot of them in jail. His knack for physical comedy is a highlight of the picture, despite being attached to a mime and an outrageously bad French accent. Nothing gut-busting here, but Moody does impress with his physical abilities. This is not to say that the film is without amusement value. It's definitely energetic and determinedly cheerful. The one threat is Barbara's stage-crazed mother, Stella (comic Madge Ryan), who is trying to stop the bus because it's attracting attention and she's enjoying the publicity that Barbara's disappearance has produced. So while there's conflict, it can hardly be considered serious, since Stella is not likely to cause any serious trouble. Despite having no serious antagonist here, the road nature of the picture helps carry it along in agreeable manner. It's one of the few non-Disney films I can think of that's completely kid-safe. Image Transfer Review: The 2.35:1 anamorphic widescreen picture is generally quite attractive. The credit for Technicolor comes up over a dingy black and white shot of London, making one wonder about the presentation, but when the red doubledecker bus hits the screen, the Technicolor fades in for an effect not unlike that of The Wizard of Oz, making it clear that we're in fantasy territory. There is a little minor ringing, but for the most part the picture looks excellent, with bright, vibrant colors. Black levels are good and detail is generally quite fine indeed. There are a few problematic elements, such as Richard's mesh shirt in the last few reels, but they are usually carried off without difficulty or major artifacting. Audio Transfer Review: The 2.0 mono track is generally good, though at times there is significant hiss and background noise. The musical numbers all come through fine and without distortion. Dialogue is generally quite clear. Extras Review: The extras are decent enough this time out as well. The commentary from director Peter Yates (Bullitt, The Deep) contains a fair amount of information, but he's not a vibrant speaker. Despite the content this tends to get quite dry. He also tends to get into pointless and lengthy disputes with the moderator as to whether particular scenes are shot on location or in the studio, and there are quite a few empty spaces. Yates also spoils the ending of The Deep, for good measure. Journalist Jonathan Sothcott seems overly impressed by some of the special effects, even though they date back to the stopped-camera work of Georges Méliès some sixty years earlier. It feels as if they're trying to give this picture more importance than it really merits. I wouldn't exactly call this commentary dispensable, but it is nonetheless turgid going that will require copious amounts of caffeine to make it through. The same bio and filmography for Richard appears again here (as on The Young Ones), and there's a trailer in rather grim condition (though it still retains that Technicolor sparkle) to round out the disc. A good-hearted and sprightly romp across Europe, with some athletic dance numbers, given a nice transfer. Not bad if you're looking for a feel-good musical.